It was granted as a gift to those that were of service to WG early in WoT's development and is rather rare in battle. It is identical in all ways to the Pz.Kpfw. V/IV but with the Greek Alpha symbol. It's based on a Pz.Kpfw. V Panther hull with stock turret from the Pz.Kpfw. IV. Many players think it's similar to a buffed Pz.Kpfw. III/IV. It has great mobility, decent acceleration and is well armored for its tier. Its weakness, however, is that it has very little gun depression, so in hilly terrain it's at a large disadvantage because even a small bump can make a big difference in its ability to hit the target or not. As a result, it's best to fight on flat ground. Additionally, the gun is sub-par for its tier, so it's more effective to flank and target the enemy's rear and side, or to aim for weakspots. The Pz.Kpfw. V/IV Alpha's speed and decent turret traverse make this tank an effective flanker. The 7.5cm KWK L/48 has the weakest penetration of all German tier VI medium tanks (shared with the VK 30.01D) so getting around to the enemy's side's and rear is vital. It shares it's hull with the Panther, so protecting the vulnerable lower glacis is a key to success. It's upper hull can bounce some shots if angled well and its high health pool (highest of all German tier VI mediums) means it can brawl quite successfully if need be. This tank suffers in hilly terrain due to the poor gun depression, often restricting the areas of the map this tank should be played. The combination of speed, engine power and weight make the Pz. V/IV Alpha a formidable ramming weapon. From July to September 1942, MAN produced two prototypes, only one of which was fitted with a turret. (It is believed that this turret was taken from a Panzer IV with its 75mm KwK 40 L/43 gun. All future Panther tanks mounted at least the 75mm KwK 42 L/70 gun. This tank is the one listed above and is sometimes referred to as the V2.) These were extensively tested and proved prone to many technical problems. At the same time, a first order for 1,000 tanks was placed, with the first tank expected in early 1943. 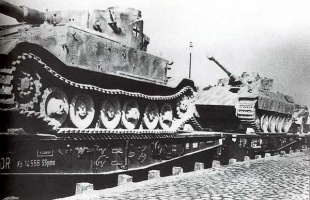 In late 1942, a small pre-production series of 20 tanks was ordered. This was the Null-Serie, or Zero Series. 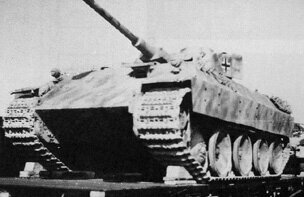 Those 20 tanks were designated Panzerkampfwagen V Panther Ausfuehrung A and were technically different from later Ausf A production models. All were lightly armored with 60mm frontal armor and armed with the early version of the 75mm KwK 42 L/70 gun. This gun had a single-chamber muzzle brake from the 75mm KwK 40 L/43 gun and was mounted in a turret that featured a drum cupola that bulged the turret on the left side. 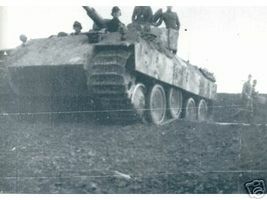 For further information on the development of the Panther, please read about the Panther. An early model Bergepanther fitted with a bolted on PzKpfw IV Ausf H’s turret (that could not be traversed), served as a command tank of Schwere Heeres Panzerjager Abteilung 653 on the Eastern Front in early-/mid-1944.